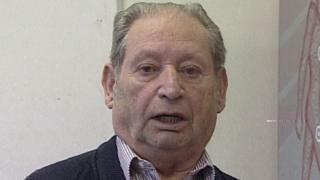 Tributes have been paid to Holocaust survivor Solly Irving who has died at the age of 87. Mr Irving spent the past 20 years visiting schools and colleges in the Plymouth area to tell his story to young people. He told them: "Try to create a better world than the one I grew up in." Mr Irving lost his parents and all four sisters in Nazi death camps, and was the only Jewish survivor of his home village in Poland. Tributes included one from St Boniface Catholic College, which thanked him for sharing his "heartbreaking story". He told the BBC how he remembered distinctly the time he was separated from his father. He said: "Personally, the worst part of it was when my father asked me to go. "I haven't even got a picture of my father, and I regret not remembering him."